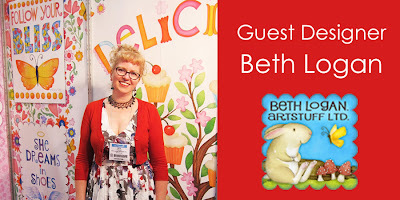 Beth Logan is the talented designer behind, Artstuff Ltd. Her new line, Buttercup Babies, should be in stores very soon. 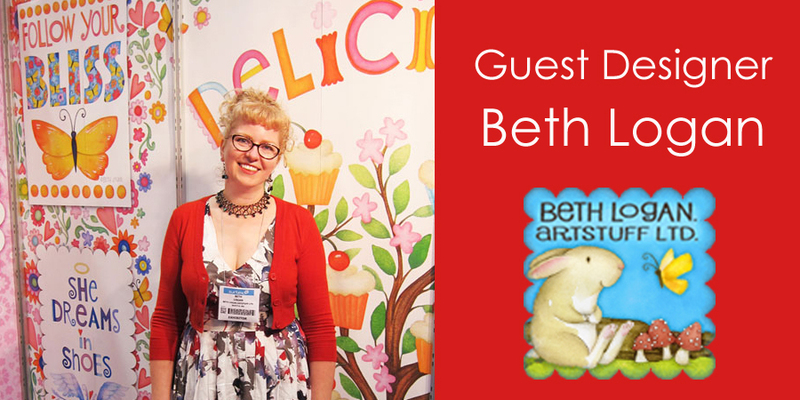 We had a great time chatting with Beth. Enjoy! HG: What is your company name? HG: What sort of design work do you do? BL: I create for the Art Licensing industry. My illustrations show up on all sorts of different products including stationery, giftware, home and garden décor, and of course fabric! BL: You have no idea what a loaded question that is! If I say “yes”, my real sewing-goddess friends and family will roll their eyes and say, “oh Beth, you do not.” but if I say “no” that’s not really true, because I sort of do. I love to make stuff, and every now and then that stuff incorporates fabric and thread and a sewing machine! I have mad respect for those with the skill, patience, and talent to create amazing quilts and beautiful clothing . . . I’m afraid no matter how hard I try I’ll never aspire to that, but I’d like to think I can still sort of try, and have some fun with it. 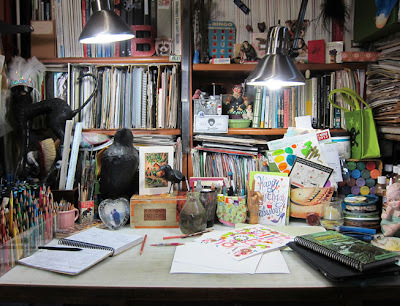 My creative process, no matter what I’m making, goes like this: I get a picture in my head of what I want to make, and without a lot of planning just start blundering toward that goal in a very haphazard way. Fortunately that works surprisingly well most of the time, whether it’s painting, cooking, or crafting - but I’m terrible at following directions which can be a real problem for those projects requiring cautious, measured steps. My cakes are lopsided, my sewing projects “uniquely shaped” and all my Ikea furniture has at least one shelf installed upside down or backwards. I once thought I would start documenting sewing projects on my blog (to force myself to do it more!) and started with this post. That was 3 years ago. Aside from some boring old mending, the only machine-sewing I’ve done since then has been some pillowcases, and one of those tank-top-cut-in-half+piece-of-fabric-dresses that are all over CraftGawker right now, which I’ll probably never get away with wearing out of the house. I really want to sew more, though. My husband just had my little Bernina serviced last week (my birthday request!) and now that she’s all clean and spiffy, I do have some pictures in my head of stuff I’d like to sew when I get a chance; if I’m feeling brave I will blog about these projects, if for no other reason, to make others feel better about themselves! HG: What is your background? Did you go to art school, etc? BL: I studied graphic design at Cornish College of the Arts here in Seattle for 2 years. I’m actually an art school dropout! I was very young, and it took me an unusually long time to figure out what I wanted to do with my life and how to make that happen. I always knew that would involve my art, but you wouldn’t guess that from some of the strange jobs I had: selling chicken at Seattle’s Pike Place Market, pushing a mail-cart in a large law firm, and managing the kitchens and cooking all meals for a couple University of WA sororities, just to name a few. 20 years ago I started creating as a full-time job. I did graphic design in the form of logos and small print-projects, I hand-painted recycled/repurposed items that I sold at craft fairs and in local galleries, did decorative painting in people’s homes, and started licensing illustrations with a couple small, local companies. Back then it was whatever creative project I could get paid for! Eventually the art-licensing side of my business grew to the point that it became my main focus. HG: Tell us a little about your family. BL: I have a close-knit extended family, most of which also live here in Western WA: my cute little 85 year old mom, 3 siblings, 9 nieces and nephews, 13 great nieces and nephews + more on the way, husbands, wives, partners, and more cousins than I will try to count. It’s a pretty awesome bunch and a hoot when we all get together. 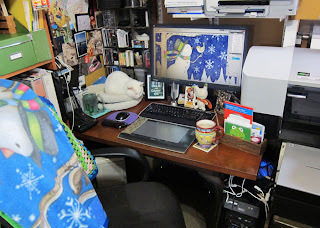 Here at home it’s a little quieter: I share our little home with my husband (married 19 years last month! ), our sweet dog Molly and crazy cat Flossie: the most adorable and weirdest animals in the world (not that I’m biased at all regarding their adorability). HG: Can we get a glimpse of your studio? BL: Sure! My studio is a tiny room in our tiny house. There’s not a lot of room to “spread my wings” but it’s home! I’m surrounded by things I love, and that’s the most important detail for me. 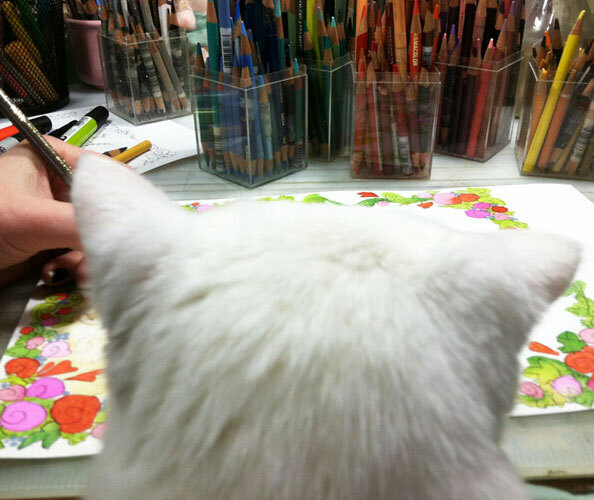 I draw and paint at my desk and spend a lot of time at the computer. Since surface-area here is at a premium, fabric and big rolls of paper get cut on a custom-sized cutting mat that fits on the living-room coffee table. Bolts of fabric, large rolls of paper, licensed-product samples, and items sold in my Etsy shop all live in an ever-so-mysterious little room at the bottom of the stairs. Over the years I’ve grown more and more fond of living and working in a small space; it’s sort of nice having everything I need (literally!) right at my fingertips! I had grand plans at the beginning of this year to renovate my studio this summer: repaint, reorganize, and more, but summer flew by so fast . . . well, there’s always this winter! HG: How do you "draw" your designs? BL: I draw and paint everything by hand, then scan it so I can manipulate it digitally in Photoshop. That way my drawings can be reformatted easily to go on so many different sizes and shapes of products. Pretty much everything around me. I think all creative people go through life soaking in everything around us, visually and spiritually, whether we mean to or not. Because of this I try to fill my life with positive stuff so that’s what ends up showing up in my art. At least I hope it does! HG: What specifically inspired this line? 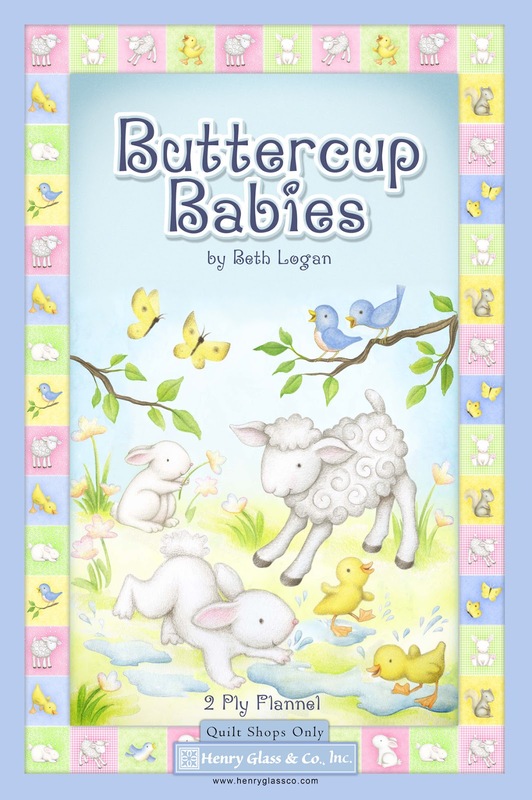 BL: I love baby animals. I know, who doesn’t? But I sort of go to extremes to surround myself with them: for the past 16 years I’ve worked as a volunteer at a local wildlife rehabilitation center, where we care for sick and injured animals. 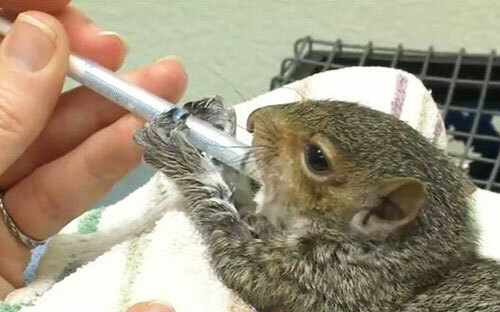 Every spring and summer we feed and care for hundreds of orphaned baby mammals and birds. Once they are released back into the wild, their survival depends greatly on a healthy fear of humans, so there is no cuddling, talking, or playing – and feeding is done as quickly and efficiently as possible to minimize contact. The way I manage keeping this distance in real-life is through my own little fantasy world I create in my art, where I draw soft, furry, sweet characters playing together that I can actually kiss and talk baby-talk to! When I draw critters, I often feel like I already know them – in a way they sort of draw themselves. 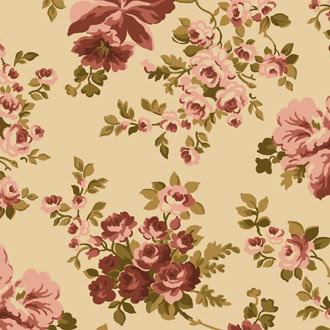 We love to see our fabrics in your shops! 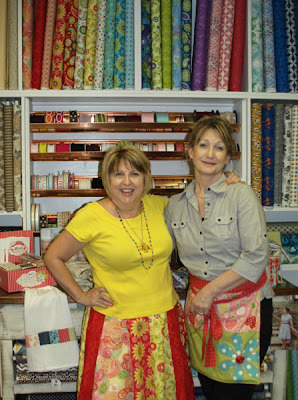 Designer Brenda Pinnick visited a darling new fabric store in her little town of Woodstock, GA. It's called Sew Main Street and it is right next door to their other store, a knitting/yarn store. Debi Light is the owner and they had their open house on Sept. 9th. Brenda did a giveaway of both fabric and a scrapbook. She enjoyed 3 hours of meet and greets with local customers. Brenda enjoyed being called "the special guest!" 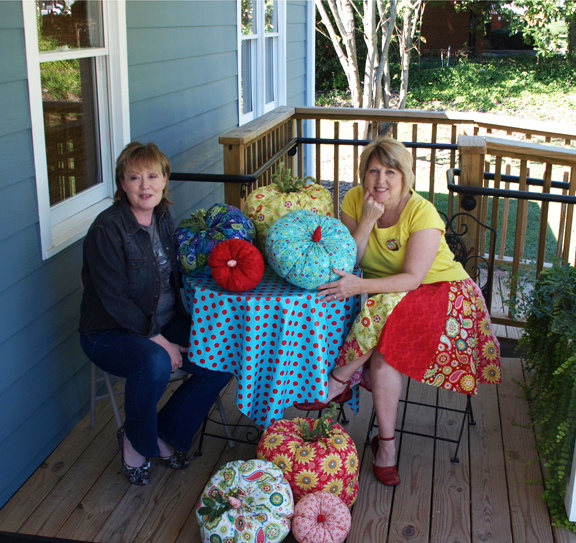 The picture on the front porch of the shop, which is an old house, is of Brenda with the quilter who made the fabric pumpkins with Brenda's fabric. We have some exciting news in the coming weeks. As you may have noticed, we've been hosting some great giveaways this week. Make sure that you read about them and enter them here and here. Today we are announcing a fabulous event that will start on October 1st. Dawn Heese of Linen Closet Designs has designed a fabulous 12-Block Sampler Quilt for you using her fabric line, Best Wishes! Now pull out your stash of Best Wishes or run out to your local quilt shop to buy some! The blocks will involve using piecing methods only. 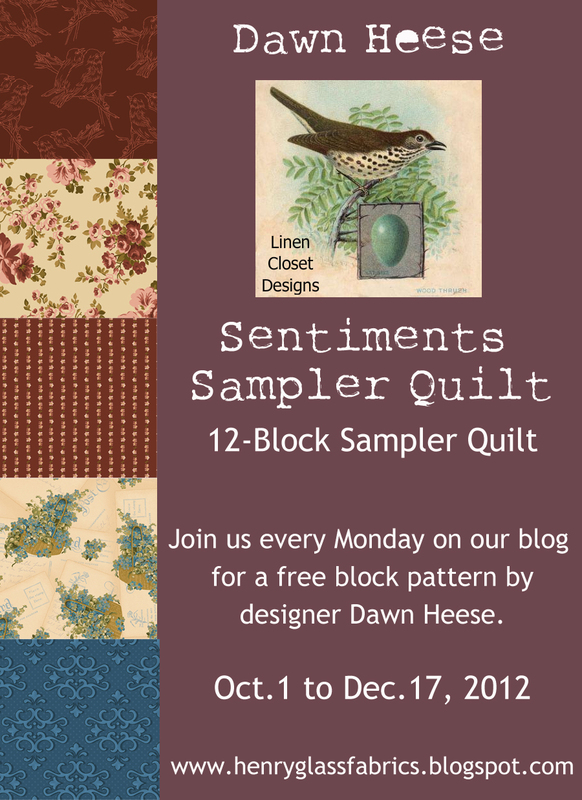 Starting October 1, 2012, we will post a pattern for a block every Monday here on our blog. 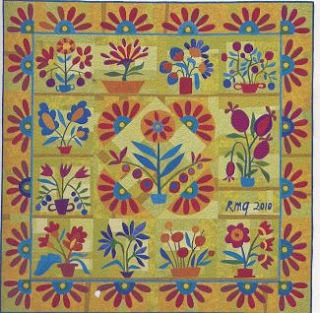 You will have all of the patterns by December 17th and potentially a finished quilt by Christmas! Doesn't that sound amazing? We think so. Let you friends know and follow us here and on Facebook to keep yourselves updated on all of the excitement for this project and for more details to come! Best Wishes & Another Giveaway! Yesterday we showed you Dawn Heese's latest pattern of pincushions. Her fabric line, Best Wishes, is available at your local quilt shops now. 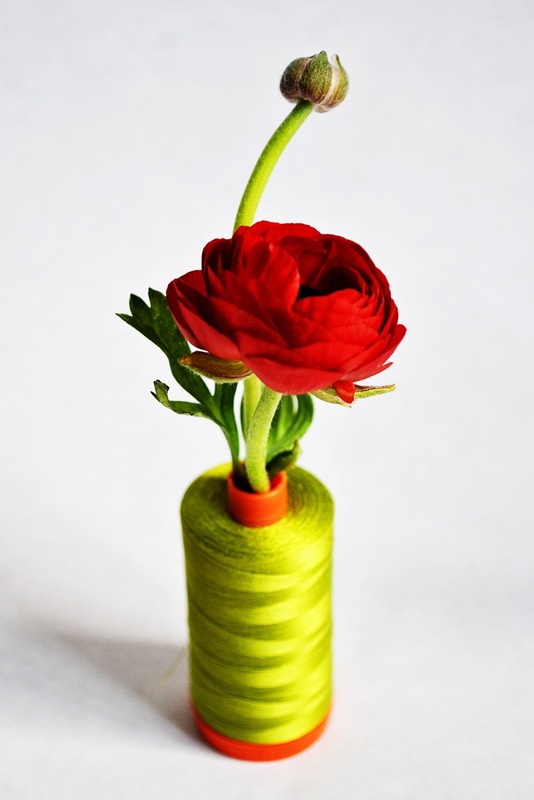 Take a look at what she's made with her fabric! Best Wishes is such a beautiful line. The colors and the images are so very pretty. 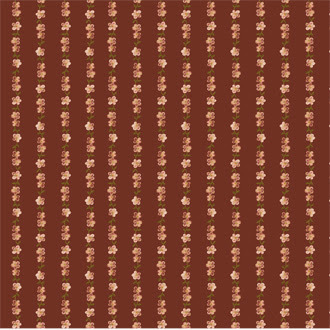 Dawn designed a free pattern for you to download. It's a lovely, cozy design that you can make especially for this fall weather that is coming our way! Enjoy some more images of Best Wishes on our website and download the fabulous free pattern while you are there! We are going to have a second giveaway for Dawn! 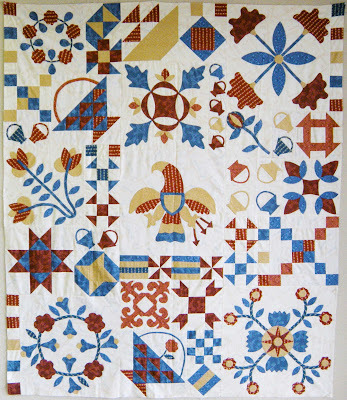 Tell us if you've ever made a medallion quilt! One winner will win a bundle of some of Dawn's fabric! Deadline is Sunday, September 23, 2012 at midnight! 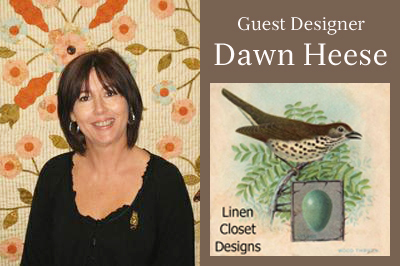 Good luck and remember to enter the giveaway for Dawn's patterns from yesterday's post! Working With Wool & Giveaway Too! We saw Dawn Heese's new pincushion patterns and loved them immediately! Adorable! We asked her for a few tips on using wool! 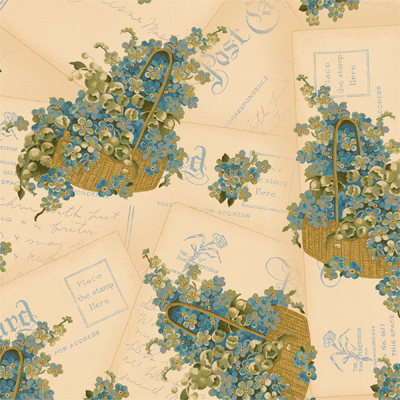 She kindly offered to give away two patterns to our awesome readers. Details at the end! Take it away, Dawn! Using wool for applique is so rewarding! 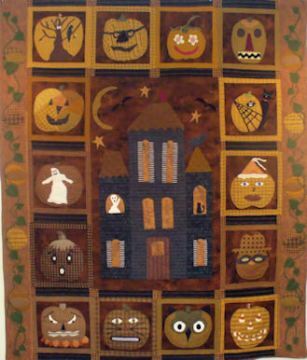 It is very fast to stitch and can add so much texture to your project. I used wool and some simple embroidery to whip up these quick fall pincushions. Wool does not ravel like cotton so you do not need to turn under the edges or add a seam allowance like you would with cotton. I generally use Weeks Dye Works or Gentle Arts hand dyed embroidery floss to stitch my wool. The hand dyes fibers blend nicely with the hand dyed wools and are available in an assortment of colors. When stitching larger pieces I use 2 strands of floss. 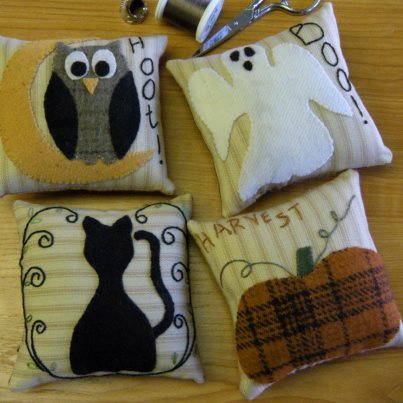 If I am stitching small pieces like the cat's tail or the owl and ghost eyes, I use only one strand. My needle of choice is a DMC chenille needle size 24. It has a sharp point and the eye is a good size for the floss. I use a simple 1/8" stitch, perpendicular to my applique piece. This secures the piece without showing a lot of stitching. When working with the very small pieces like the tail and eyes, it is nice to use a fusible such as Steam-A-Seam Lite 2. The tiny pieces are impossible to pin and the fusible keeps everything in place for stitching. If you use a fusible, remember to reverse your applique templates. Great tips! Thanks, Dawn! Dawn has a new book, Inspired, and it is fabulous. 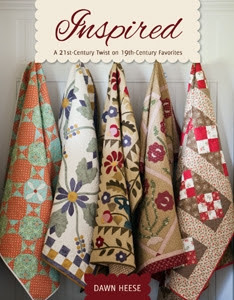 Be sure to run out to your local quilt shop to buy your copy! Now tell us your favorite thing about fall and we'll pick two winners to win a copy of her pincushion pattern. Giveaway ends midnight, Sunday, September 23, 2012. Oh, How We Wish We Were There Too! 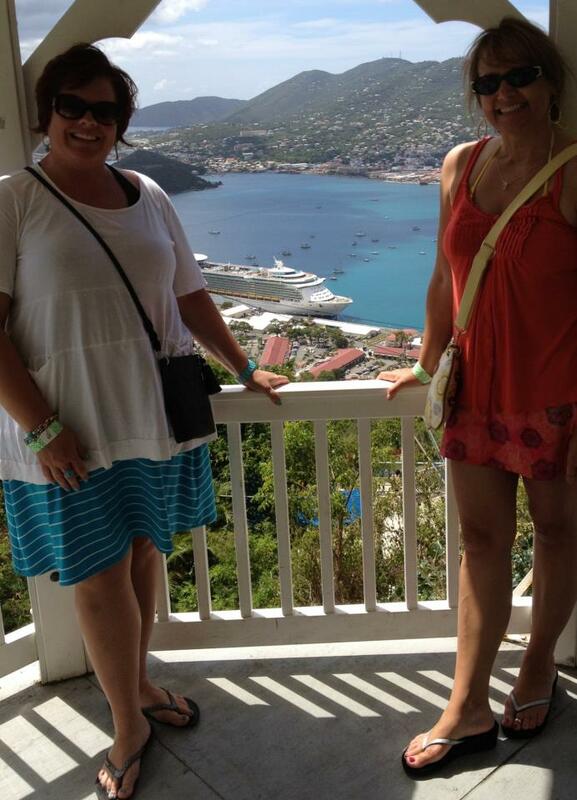 The Lizzie B Cre8ive ladies are teaching on a quilting cruise this week. How we wish we were there with them! This is the beautiful project that they're teaching. Lovely! Have you ever been on a quilting cruise? Who was teaching and where did you go? Make us jealous! Liz and Beth will be guest designers here very soon! That is when and if they want to return from their trip. Do come back and visit then! What Did We Ever Do Without Technology? It is just one of those weeks. Oh, but it is only Tuesday! 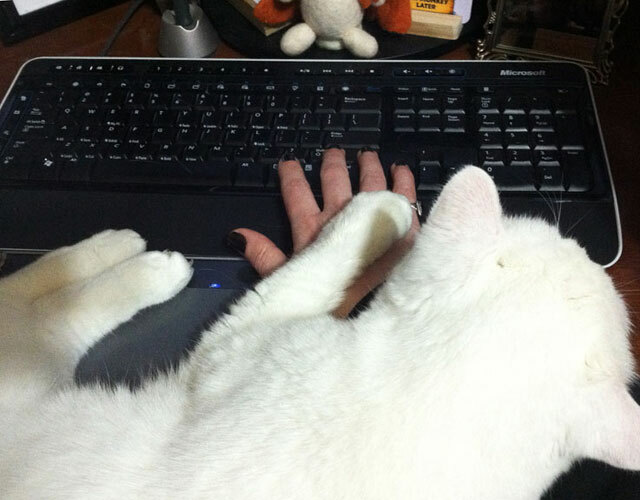 E-mail around here is not functioning properly. This situation lead to the question, what did we ever do without technology? Even if technology is not an issue, can you imagine what it would be like without a hobby? Tell us, what does having a fabulous hobby as quilting or sewing mean to you? Are you looking at making some quick weekend projects or do you need something to inspire you to run out to the local quilt shop this weekend? We thought that we'd highlight a few projects for you. They're all from our free projects download page. There's lots more and we know that you'll find something interesting in our collection. Do you spend weekends going to thrift markets? 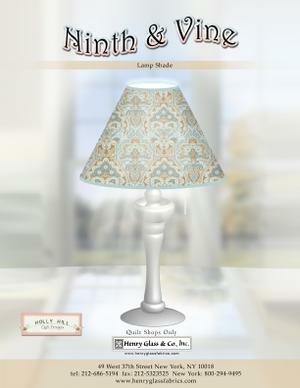 The Lamp Shade pattern by Mary Jane Carey of Holly Hill Quilt Design for the Ninth & Vine line is a fabulous way to spruce up any lamp that you pick up along your travels. We think that it's a lovely idea to make yourself a tote to shopping with. 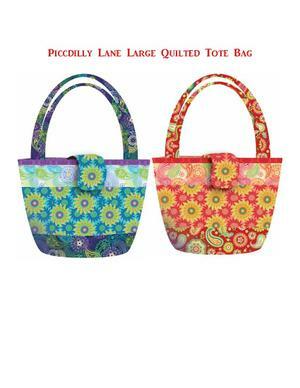 The Piccadilly Lane Large Quilted Tote Bag by Brenda Pinnick is a gorgeous pattern and easy too! Need a new look in your house? 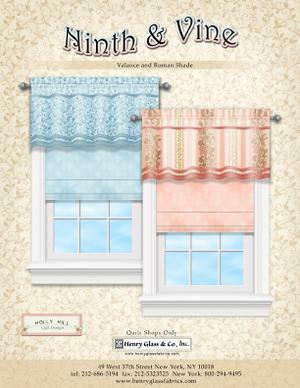 The Valence and Roman Shade pattern using the Ninth & Vine should be enough inspiration for you to change up your window treatments. 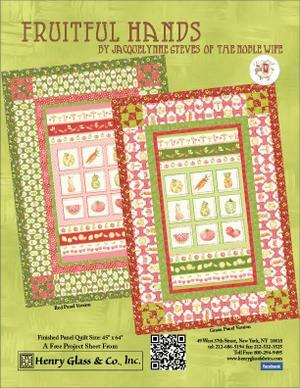 Jacquelynne Steves of The Noble Wife has designed a few projects from her fabric line, Fruitful Hands. These are so perfect to hang in your breakfast nook! 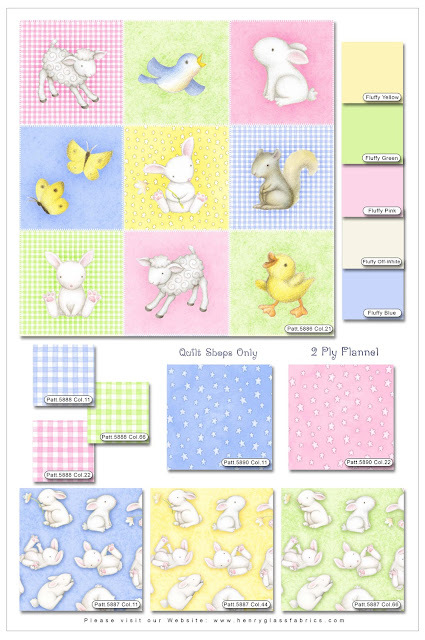 Enjoy looking through our newfree patterns collection! You are sure to find a project that will inspire you to sew this weekend! 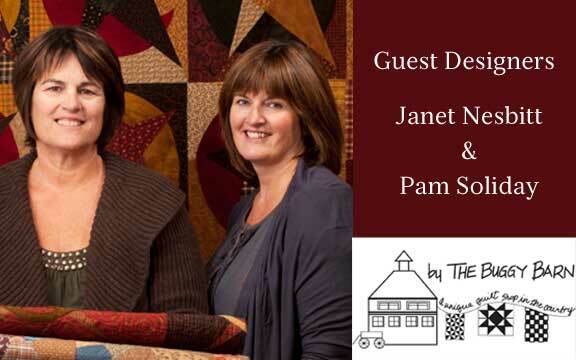 Today we welcome The Buggy Barn ladies, Janet Nesbitt and Pam Soliday! We had a lot of fun with this interview and we know that you'll love getting to the ladies too. Go to their website to check out their wonderful kits, patterns, books and BOM designs. Pam & I were raised on the family wheat farm in Reardon. We grew up in the same house our dad was raised in, and like most farm kids, we grew up helping with hay and harvest, and lending a hand with all those other chores that needed doing. Sometimes we weren't so helpful, like the summer our older cousin taught us to "pick a bean, pick a blossom." Henry just couldn't figure out why his green beans weren't producing! In spite of the bean episode, we developed our work ethic on the farm. After Pam was married, her husband, Ron, joined Dad working the farm, and Pam was a stay at home mom and raised their three daughters. When her girls were taking naps, we would quilt. 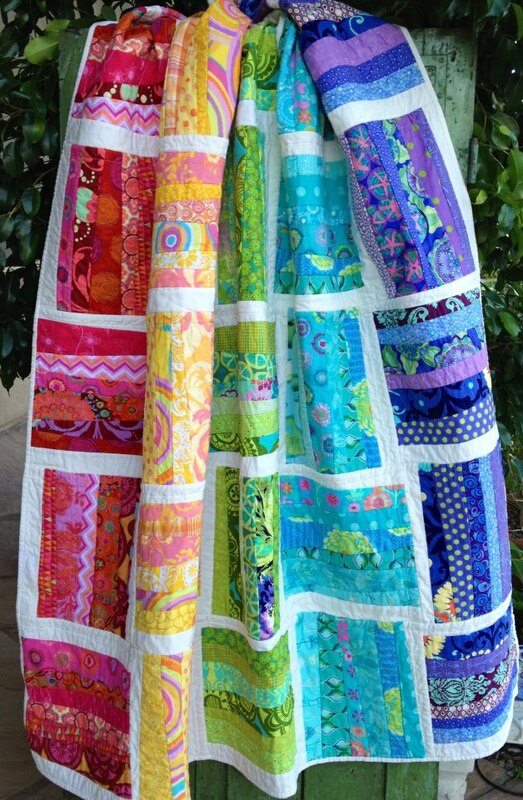 My first quilt in 1975 was from a McCall's pattern and every piece was cut out with scissors after first pinning on the tissue paper pattern! Those really were the "dark ages!" I eventually got a degree in civil engineering and worked in the LA and Seattle areas but my husband had a job opportunity that brought us back home to the Spokane area where I "retired" to stay home with our two boys. However, plans change, and in the fall of 1996 when Pam's youngest daughter went off to college and my youngest son climbed on the bus for his first day of kindergarten, we opened the doors of the Buggy Barn, in a barn at my house that really was a buggy barn, hence the name! Our shop is small, and we learned young, that you can't have it all, but what we do have are the things Pam & I love best. We have always been scrap quilters who love antiques and folk art and all things primitive, which is reflected in our store. We stock the things that we want for ourselves so it's a bit like shopping in our stash. I used to put my favorites away in the back room because I didn't want it all to sell; after repeatedly being "caught" and reminded that we were trying to make a living here ("it's supposed to sell"), I've had to work on my sharing skills! Because we are out in the country away from the "big city" ," we developed our "crazy" technique, originally designed to be offered as a class to try and entice customers to make the drive out to our shop on a gravel road to receive that distinction! In 2003 (I think? 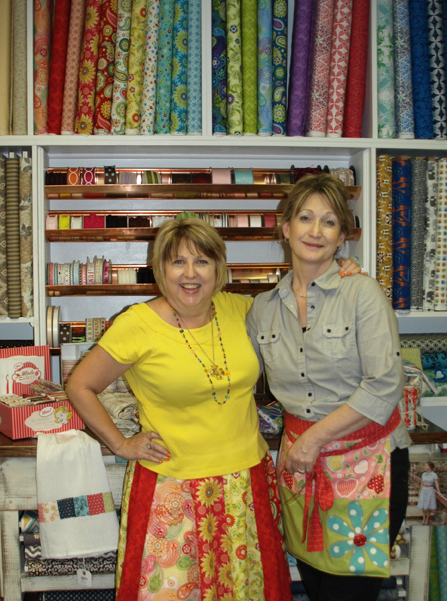 ), Alice from "Little Quilts" was kind enough to introduce us to the folks at Henry Glass who asked us to design fabric and they have put up with us ever since! We currently have four lines in various stages of production, with "Harvest House" currently available in stores but each new line is my favorite! After we made it through our first year in business, we decided to put on an outdoor quilt show as a thank you to all of our new and loyal customers. We've continued this tradition the last weekend of every August since that first show. The quilts look spectacular outside. It's something about the light and it is amazing! 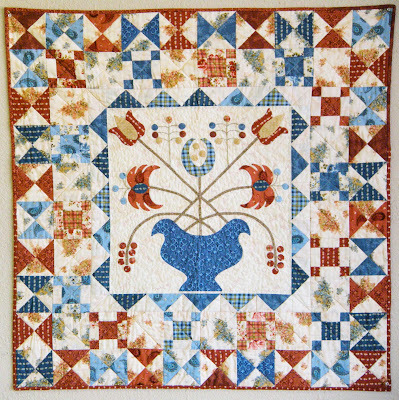 Quilts are hanging on barns, fences and clotheslines. Over the years, we've added concessions as well as a juried folk art sale. We bring in nationally known teachers who teach the week prior to the show. We hope to see you at our show! Thanks for the wonderful visit!